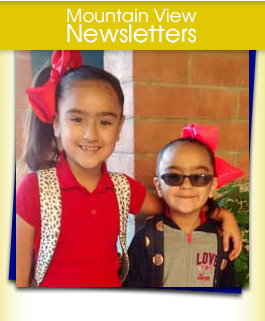 Want to know what’s going on at Mountain View Elementary? You’ve come to the right place! We’ll keep you updated on the latest news that’s relevant to students, parents, and our surrounding community. Check back often! Santa Cruz Valley Unified School District No. 35 (Rio Rico, AZ) hereby formally notifies the local community of our intention to apply to the Arizona Department of Education for a 21st Century Community Learning Centers – Cycle 15 program grant for the following schools: San Cayetano Elementary, Mountain View Elementary and Coatimundi Middle School. Our application is due to the Arizona Department of Education by May 6, 2019. We also take this opportunity to inform private schools, faith-based organizations, community-based organizations, and other public agencies of our intent to provide safe, accessible academic and enrichment programs before-school and after-school during the 2019-2020 regular school year and summer school. All questions regarding our proposal should be directed to SCVUSD No. 35 Grants Coordinator at 520.375.8260. Would you like to become more involved with school? Join us and be a parent volunteer! You can help with special events, making copies, fundraisers, etc. You can help us create a safe, challenging, inspiring, and fun school environment for all our students. Please give us at least 24-hour notice so that we may properly plan and coordinate all aspects of your visit. We love our parent volunteers! Check here for our latest newsletters. Mountain View has begun participating in the Air Quality Flag Program sponsored by the Arizona Department of Environmental Quality. Please visit AirNow to view current Arizona air quality information.